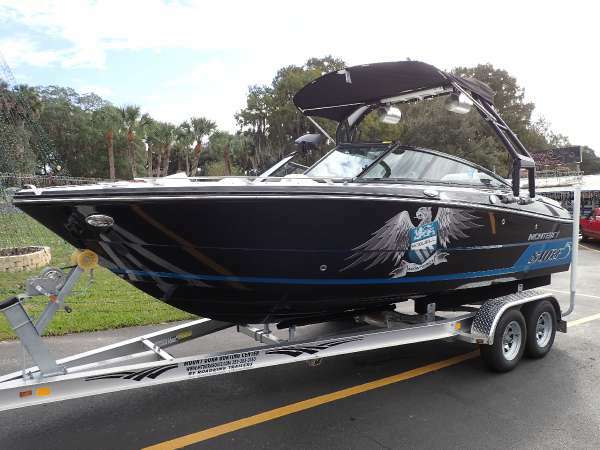 2016 Monterey 218SS Roswell Surf Edition - Brand New Volvo Forward Drive - Great Surf Wake - Options: Volvo V6 280 Forward Drive, Gel Hull Bottom, Roswell Surf Edition, StainlessSteel Package, Underwater LED Lights, Bow & Cockpit Covers, Depth Sounder, Roswell Cockpit Inlay, Stereo Remote Helm & Stern, Transom Tilt Switch, Battery Charger w/Deck Plug - The best-selling boats in the industry just got even better. 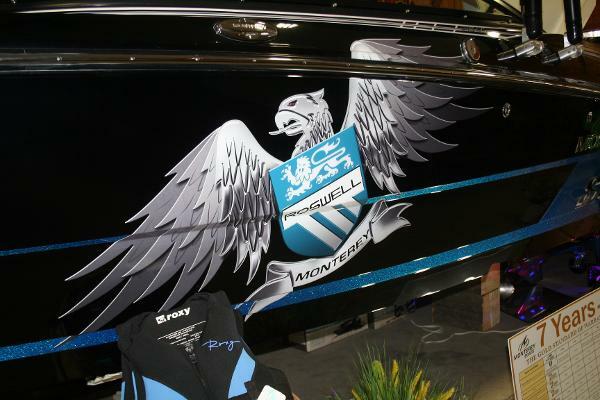 Monterey Boats has kicked into high gear for the 2016 model year, fueling your passion for water sports with a luxury performance edition. Our new Roswell Surf Package option is available on both the Monterey 218SS and 238SS Super Sports; this all-new option starts with an innovative helm design featuring one touch Zero Off GPS speed control, a high volume ballast system, collapsible wakeboard tower with cam assist, wakeboard / surfboard racks and surf tabs. Factor in the newly designed Roswell graphics, metal flake gel coat options, and specialized Roswell audio package and you have got a design that creates a perfect wake-surfing and wakeboarding experience. - Forward Drive! 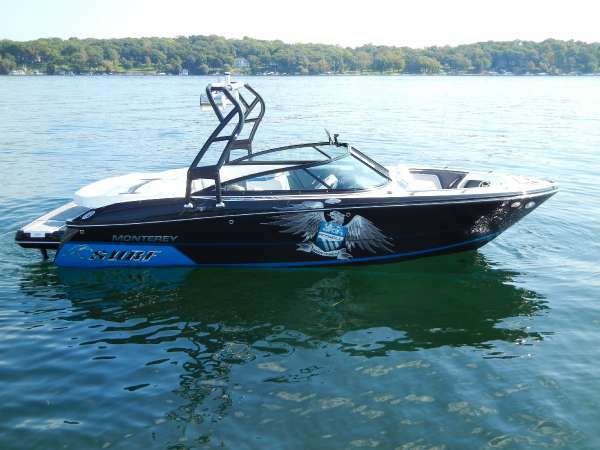 2016 Monterey 218ss Roswell Surf Edition The best-selling boats in the industry just got even better. Monterey Boats has kicked into high gear for the 2016 model year, fueling your passion for water sports with a luxury performance edition. 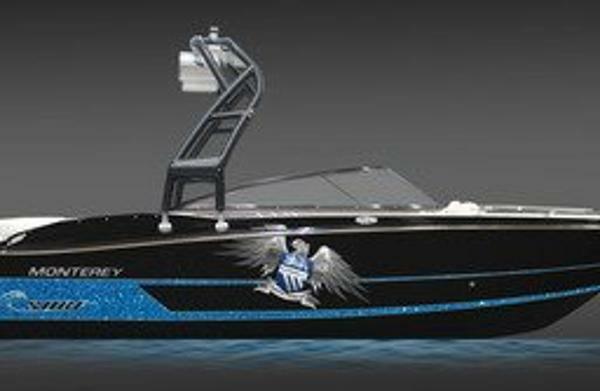 Our new Roswell Surf Package option is available on both the Monterey 218SS and 238SS Super Sports; this all-new option starts with an innovative helm design featuring one touch Zero Off GPS speed control, a high volume ballast system, collapsible wakeboard tower with cam assist, wakeboard/surfboard racks and surf tabs. Factor in the newly designed Roswell graphics, metal flake gel coat options, and specialized Roswell audio package and you have got a design that creates a perfect wake-surfing and ski / wakeboarding experience.